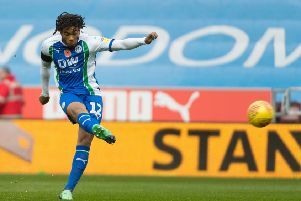 Christian Walton hopes to have a hand in Wigan Athletic’s bid to climb up the Championship table after getting some game time in Dubai. before young keeper Owen Evans took over for the second half. And after the success of the mid-season training camp, Walton hopes to reclaim his place from Jamie Jones. “It’s part and parcel fo football,” he said. “There’s not a lot I can do other than keep training hard and my time will come again. “It was a good trip, we had the game which was good for the lads who haven’t been playing to get minutes like myself. “I’m thankful to the club for doing it. Walton, who has been linked with a summer switch to Derby County, thinks the timing of last weekend’s camp was ideal before a crucial run-in, starting with Ipswich’s visit to the DW tomorrow. “It was really good, it brings everyone together as we were with each other for four days,” he said. “Now is a massive part of the season. “We have Ipswich on Saturday and they’ll be fighting to stay in the division so it will be a big test, a big few games in the run-in now. “You just have to look, they have signed well in January so they’ll be fighting all they can because they don’t want to lose that status.